People do not always like change. Okay, most despise it. If this sounds like you, there is a good chance there will be parts of Windows 8 that you may not like when you try it out. If the Start menu is one of those things, here is a quick fix. The quick breakdown of what you will get by installing Metro Cheat for WDP (Windows Developer Preview) is the option to use either the new style Start menu or the Windows 7 style Start menu. That’s right, you can use either one. 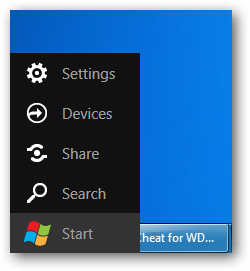 If you are accustomed to the Windows 7 style but want to learn how to use the Windows 8 menu, Metro Cheat for WDP would work well to help you do this. The Metro Cheat for WDP file you will download is a 7z file. That means it is easily opened with 7zip. Once you have Metro Cheat for WDP extracted, you simply click on the file to run the .exe file. After you have granted the application permission to run, what you should see is the logo pop up then your Desktop may refresh. 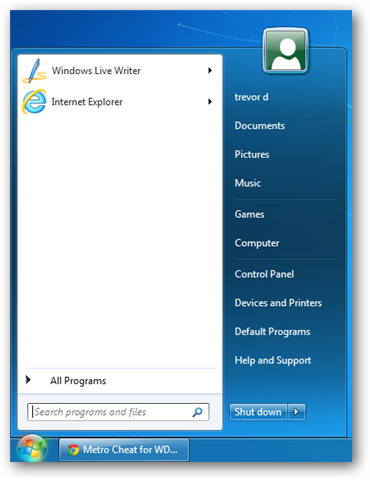 The bottom left corner where the old Start menu button was is now changed to look like the Windows 7 Start menu icon. If you click on this icon, you will see the old style Windows 7 Start menu. 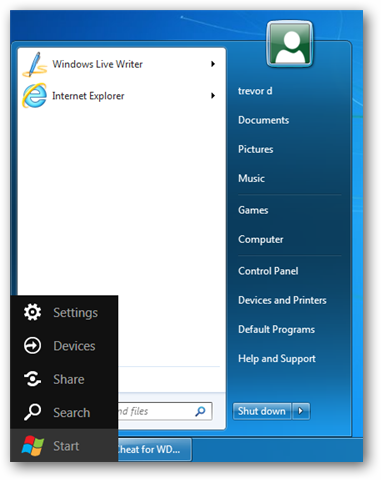 As I mentioned earlier, you can still use the Windows 8 style Start menu too. To activate it move your mouse to the bottom left of the screen like usual. The same options will pop up like they did before. If you want to access the Metro tiled screen, you will need to activated it by scrolling your mouse to the far bottom left then clicking Start. If you click on the Windows logo key on your keyboard, you are taken to the Windows 7 style Start menu. There is the ability to use both menus at the same time if you are so inclined. They are both active. Here is a screen grab of both activated at the same time. Metro Cheat for WDP is a really simple fix if you are not a big fan of the Windows 8 Start menu. Other than changing what the Windows button does, there do not seem to be any other tweaks or major changes to how Windows 8 operates.